In the western part of the Twin Cities, nestled between Golden Valley and Minneapolis is Theodore Wirth Park. A space almost as large as New York City’s Central park. With in Wirth (as it’s known to the locals) you will find several scenic, natural areas around Birch pond and Wirth Lake, plus two golf courses and a fabulous mountain bike trail system. For Twin Cities cyclists, it’s a natural playground you should be exited too explore. What would become Theodore Wirth Park started in 1889 when 66 acres were purchased and established as a park. Now Theodore Wirth park (named after the park system’s superintendent from 1906 to 1936) has over 750 acres. The Central to the park is the Wirth Chalet, a stone and timber structure that offers events, and product rentals for snow sports. If you are interested in riding the mountain bike trails of Wirth park, I find it easiest to park at the beach house off Glenwood avenue. From there it’s a quick spin west over to the trailhead. If your interest are in the golf courses or Grand Rounds and Luce Line trails, the Golf Clubhouse on Theodore Wirth Parkway is your best starting point. The trails at Wirth are predominantly designed for the intermediate rider. As you enter the trails at southern entrance you are greeted with a twisting climb up thorough rolling prairie and into well established woods. The trails themselves are well manicured and smooth with ample bermed turns. Expect to see narrow ribbons of brown winding through ample green surroundings. When you find your way into the northern trails, more rocks get introduced. The majority of the rocks are well embedded into the trails and act as exciting obstacles to manage. The northern trails also exist in denser forests, with far fewer field areas. Overall, the Trails at Wirth are fun and flowie, offer challenges for the most advanced riders while being accessible to casual riders. The Grand Rounds Scenic Byway is one of the countries longest continuous urban parkways. 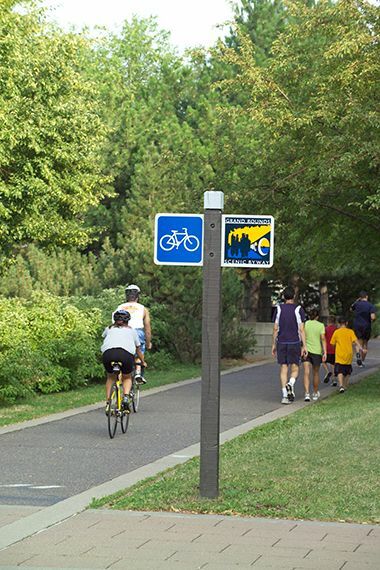 It is a connecting trail to more than 300 miles of regional trail around Twin Cities Metro Area. It also acts as the connecting trail between most of the parks in the Twin Cities area. That said, you can enjoy a day trip on the Grand Rounds Trail all over the Twin Cities via protected and paved bike lanes. The Grand Rounds travels through 7 districts: Chain of Lakes (13.3 miles), Minnehaha (12.6 miles), The Mississippi River (9.2 miles), Downtown Riverfront (1.2 miles), Northeast (6 miles), Victory Memorial (3.8 miles) and Theodore Wirth Park (4 miles). Additionally, this trail is cleared by 6am every day through the winter if you choose to use it for commuting. The Grand Rounds Bike trail here connects to the binning of the Luce Line trail. The Luce Line trail is a 63 mile limestone path stretching from Cosmos in western Minnesota to Wirth park. It is available for Biking, hiking, running, jogging, and snow activities in specified areas. This trail is an exceptional way to explore neighborhoods and destinations west of the city. If you ride and enjoy the trails at Wirth, consider volunteering for trail maintenance. 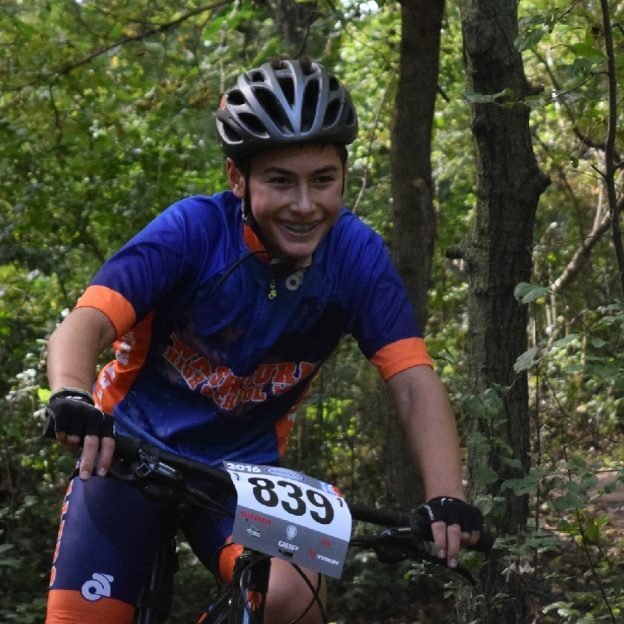 The Minnesota Off Road Cycling organization (MORC) schedule trail work sessions on Wednesdays through the summer. Consequently, the group meets at 6 O’clock and welcomes anyone interested in helping. Wear long pants, boots, and work gloves because you will be doing hard labor. Moreover, you will find that the hard labor is enjoyable because you are giving back to fellow riders. The mountain bike trails in Wirth Park are extra fun in the winter on a fatty. 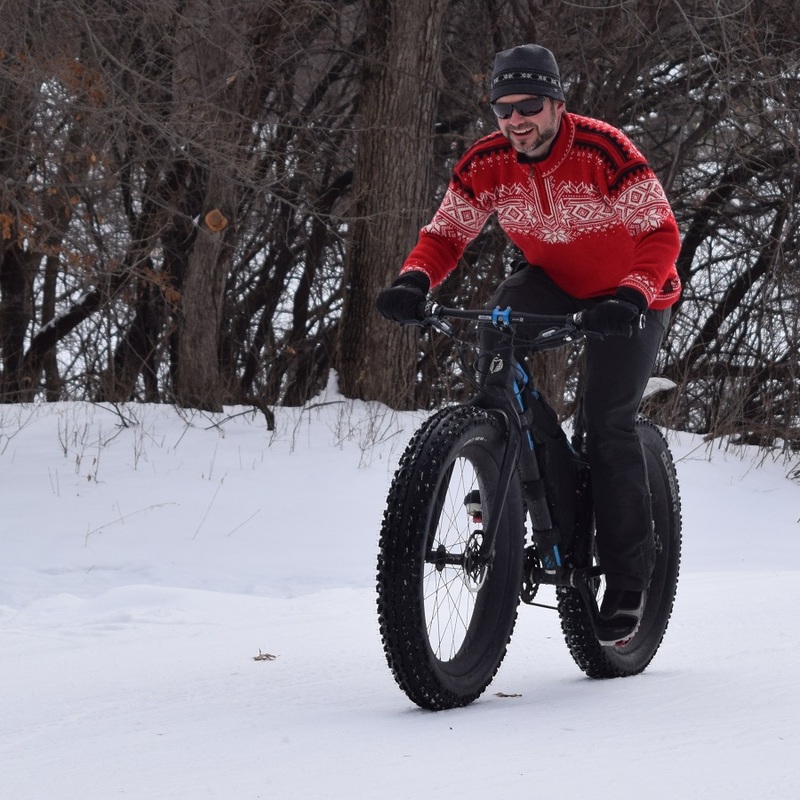 While the trails are open through the winter, Fatbiking is not the only sport you can enjoy at Wirth. Therefore, snowshoeing, cross country skiing, tubing, sledding, skating, and, ice fishing are all available within the park. When planning a ride in the fall and spring, be sure to check the MORC website for trail conditions. This entry was posted in Destinations, News and tagged cycling, grand rounds scenic byway, grand rounds trail, Luce Line Trail, Minnesota Bike Guide, Minnesota Ironman Bike Ride, Minnesota trails, Mississippi River Trail, MN Bike Guide, MORC, Mountain Biking, mountain biking fun, mountain biking miinneapolis, MTB Minneapolis, MTB Minnesota, Ride My Bike, Theo wirth park, Theo Wirth trail, Theodore Wirth Park, Twin Cities Gateway on August 27, 2017 by John Brown.